A new book explores the history and meaning—and the promising future—of sacred architecture. For centuries in Rome, great masters of architecture vied for commissions from the popes, and they designed all the better for it. Raphael (1483–1520) completed spectacular paintings in the papal apartments, and broodingly brilliant Borromini (1599–1667) and dapper Bernini (1598–1680) splashed the canvas of Rome with exquisite monuments; in the end, Rome was left with a panoply of some of the most awe-inspiring sacred architecture in history. These were masters of their art, the short list of “go-to” geniuses of their day. You may have visited Italy and seen their works—the splendid St. Peter’s among them—and you may have lamented that the age of grand sacred architecture has passed. But in our own time, we also have a short list of master architects who design marvels, a marriage of engineering, art, and attention to the Divine. Duncan Stroik is one such architect, contemporary yet classical, whose new book, The Church Building as a Sacred Place: Beauty, Transcendence, and the Eternal, takes its place alongside those published in recent years, such as Ugly as Sin by Michael S. Rose (Sophia Institute Press, 2009), No Place for God: The Denial of the Transcendent in Modern Church Architecture by Moyra Doorly (Ignatius Press, 2007), and In Tiers of Glory: The Organic Development of Catholic Church Architecture Through the Ages by Michael S. Rose (Mesa Folio, 2004). Stroik’s work is a much-needed optimistic view of architectural trends today, and a vision of hope for what can, will, and is being done in new Catholic church design and re-design. Dr. Stroik, Professor of Architecture at Notre Dame, is a specialist of Catholic sacred architecture—“beauty in service of the liturgy,” as he puts it (151)—a specialty that shines in this large-format book, rich in color photographs and straightforward in layout. Quite simply, it is a book that “seeks to offer timeless principles which are crucial for church architecture” (ix). The title of the Introduction sets the tone: “The Restoration and Promotion of the Sacred Liturgy.” And why seek to restore and promote? Because sacred architecture is the fiber of our Catholic heritage, “a catechism in paint, mosaic, and stone” (1). This book is not only an exhaustive treatise on Catholic architecture, it is a timely guide for bishops, priests, and laymen who wish to better understand the Church’s architectural heritage. Part handbook, part art book, and part history, it is equally suited for the layman’s bookshelf or the drafting table of a church building committee. It is the book we have been waiting for, both inspirational and readable, laden with astute quotes and poignant references to papal texts and other Church documents. Stroik’s book is divided into four sections, taking the reader from a look at church design (as both sacred and altar-focused), to a consideration of the church as sign and symbol, and then, in the third and fourth sections—the bulk of the material—examples of what aligns with historical convention and what does not. Stroik leads readers through an understanding of what the Western tradition is and where it has fallen short in recent years, then provides a road map to how we may build well again. The closing chapters are directed especially to pastors and the laity, instructing them in how they might best approach renovations and new building projects according to the historical practices of the Church. Stroik speaks likewise to architects, reminding them that since church architecture is a foretaste of the eternal, architects of sacred space “cannot afford to be lukewarm” (46). While this work avoids self-promotion, it takes advantage of Stroik’s many years as a leader in the field of Catholic architecture. Appendices include mention of important Church documents for reader reference. In sum, as a succinct education on how we may honor God in stone, it is an architectural catechism. The church, more than merely a meeting/worship space—more than a “sum of its parts” (51)—is, as Stroik informs, a “place set apart,” a place where God and the faithful meet (2), and not simply where the faithful meet each other. The structure of that space matters, since it shapes the encounter we experience. Stroik’s narrative often uses an easy-to-follow question and answer format, offering a bit of history, prompting a question, and providing doctrinally sound answers. He asks, for example, how the church building can visually remind us of the sacraments, then answers that the visual cues of baptismal font, confessionals, or altar rails can direct our attention to the Blessed Sacrament, the axis of our faith. Devotion is promoted through signs and symbols, writes Stroik, and iconoclasm should not be mistaken for “noble simplicity” (79). In the task to produce visually engaging sacred spaces, the Catholic architect is ultimately answerable to the Divine Architect (124). “The sacred must come to us through all the senses,” writes Stroik (4), and while we view the mysteries of our faith as through a veil, it is our senses—the wood of the pews, the cold of the marble, the dome that lifts our eyes heavenward—that direct our attention toward the Divine. Choices made by architect and patron will either help or hinder these essential goals. Stroik punctuates his book with numerous illustrations, worthy examples of churches spanning the length of Christian history; a few are of his own work, giving us hope in the possibility of continuity in an age that we sometimes fear may have forgotten how to build well. Stroik shows that building well is still possible, while also reminding readers that there is no one, all-encompassing formula; and though the task is challenging, it is perhaps made lighter through this publication. Although Stroik claims that this is not an historical work, the second section provides the historical overview needed to understand, for example, the logic behind the cruciform plan (42), and why a Catholic church should look undeniably “Catholic” (56). Stroik advises that the architect, who best understands architecture, and the priest, who best understands liturgy, should work collaboratively. The “Liturgical Design Consultant” (LDC) trend of the late 20th century often failed to produce beautiful church architecture, and it is a fad that is gradually giving way to a renaissance of well-informed seminarians and emerging classically-trained architects (such as Thomas Gordon Smith, among others) (9-10), who collectively understand the symbiotic interplay between architecture, liturgy, and Catholic belief. Would we dare to suggest that Chartres or the Gesù are unsuitable sacred spaces because they lacked a Liturgical Design Consultant? The church, suggests Stroik, is more than a liturgical space, it is theological (57); therefore it is wise to broaden our view to the full scope of historical Catholic architecture rather than limit it to the recent past (154). History, as Kenneth Clark has said, is ourselves, and design answers may be found in our long tradition. In this extensive Catholic building tradition, we seldom find a design emphasis on the central (pews in the round) or horizontal (low-ceilings), with spaces that do not allow us to “look upward.” Catholicism has been and continues to be God-focused, not man-focused, and it is time again for our churches to reflect the eternal rather than the ephemeral. Stroik offers several means for accomplishing this, with the essential concept of church as sacred place, or domus Dei, an understanding that brings us to the “gate of heaven” and in turn demands our very best (13-14). What the reader will notice is that, while the importance of practicalities such as square footage and specialized rooms are not diminished, they are insignificant if we have forgotten the point of the enterprise. Interspersing his text with quotes from Church documents on architecture and liturgy, as well as voices of past architects and popes, Stroik weaves a rich tapestry of tradition in continuity, a conception of design that takes the Eucharist as its center. Rather than conceiving of the church as a series of functional spaces, we would do well to perceive the building as radiating from its source, the holy altar (19). We must, writes Stroik, create architecture that reinforces belief in an age that “doubts the efficacy of the sacraments” (20). For readers seeking examples and specifics regarding material choices, dimension details, and symbolic meaning, they will find them here: answers to such questions as why stone altars may be preferable to wood, how the “communion of saints” may be made visually manifest in the interior, and why such concerns are important to Catholic architecture. 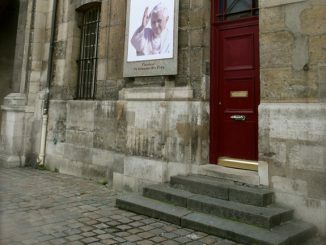 What Stroik advocates is far from “banal nostalgia”; rather, he encourages “unity, harmony, beauty, tradition, symbols, and recognizable imagery”—the regaining of something lost, or as Pope Benedict XVI has called it, a “hermeneutic of continuity” (19). Stroik untangles thorny problems, such as the relationship between the altar and the tabernacle (26), the relationship between nave and sanctuary (27), and sacred building as sacramental (40); he dispels the “myths” of post-Second Vatican Council design “requirements” (60), in addition to countering notions that “static” tabernacles “distract” the faithful during Mass (88). Stroik’s work is forthright and fearless, charging that in recent years we have “built functional-looking buildings that do not function” as sacred space or as Catholic churches (88). Whereas the churches of Europe are marvelous in part because of their spaciousness—places to wander, to ponder, and to pray—American churches are too often focused exclusively on functionality where each space must be physically “useful”; this oversight is spiritually ineffective (130). 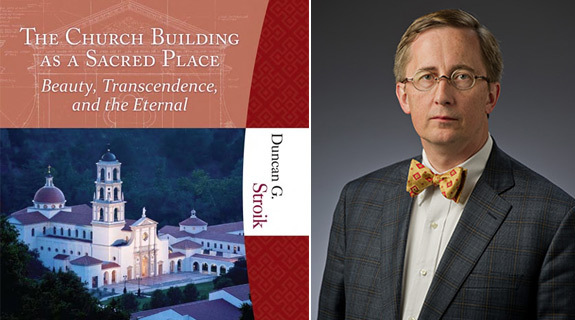 While historical and critical, Stroik’s book is a guide for those interested in Catholic sacred space, and for becoming better catechized in the extensive tradition of sign and symbol within the faith. In design and re-design, he urges (a) for a “humility toward sacred works,” (b) to respect existing historical elements, (c) for retained harmony, (d) for increasing high quality in design and materials, and (e) for sensitivity to the attachments of the faithful (97-98). “Just as the Church has room for more saints,” writes Stroik, “her temples should always have room for new artwork, decoration, and elaboration, as long as it’s done with harmony, beauty, and respect for the Catholic tradition” (129). The lay faithful and the clergy/religious should endeavor to better learn this tradition through wider reading and travel and viewing of Catholic monuments, both of which he provides with many recommendations. Whether you are a priest wishing better to equip a space for the Holy Sacrifice or a layman hoping to better understand the spatial experience of Sunday Mass, The Church Building as a Sacred Place is recommended for clergy and layman alike. The book excels in being both accessible while being specific. If the retail price is a deterrent, consider making an official request at your local or academic library, or pool funds toward purchasing a copy for your parish library. Since churches are teachings in stone, all would benefit from understanding more clearly the architecture in which we worship, a space which—following Winston Churchill—after it has been formed, then forms us. It is imperative that we “reestablish the meaning of the church as a sacred place and reassert the sacrificial aspects of the Mass” (135), for beauty, as St. Augustine wrote, is ever ancient, and ever new. Duncan G. Stroik. The Church Building as a Sacred Place: Beauty, Transcendence, and the Eternal. Liturgy Training Publications, 2012. 192 pages. $75.00. Dr. Amanda C.R. 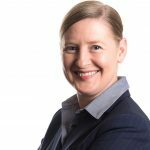 Clark, Ph.D. is co-author, with Leland M. Roth, of Understanding Architecture: Its Elements, History, and Meaning and American Architecture: A History. She is Associate Dean of Special Programs and Library Director at Whitworth University in Spokane, Washington.